I just bought a potted Hydrangea plant from the grocery store yesterday. When I got home I discovered I had two plants in the pot. I soaked the pot overnight and then I removed all the blooms and put them into a few quart jars from the canning cupboard. I planted the Hydrangeas in hopefully a good spot with only a bit of morning sun. With the extreme heat we experience during the summer I might have to find a golf umbrella and shade these babies for a while. Last evening as I was walking about the garden doing a little dead heading on the roses, I cut these blooms from my new rose bush. The rose is 'Red Gold' a AARS winner 1971. Florabunda Golden edged in deep fire red with a light fragrance. The french wire basket is holding the jars so I can move them around the picnic table as we need more space to eat and study our next project for the kitchen remodel. We have the new floor installed and It is going to be so easy to clean compared to my 22 year old white vinyl. While we were out on Saturday we decided to buy a new range. We have a 22 year old Jenn-Air with the build in downdraft ventilation system. We decided to keep the stainless steel cooking elements from the old range and just purchase the Slide-In range. It is all digital and a more accurate oven temperature. Sweetheart is installing the range as I write this post. I will be helping him sometime soon, but meanwhile I'm polishing and cleaning the living room. We need one room with some calmness to it. 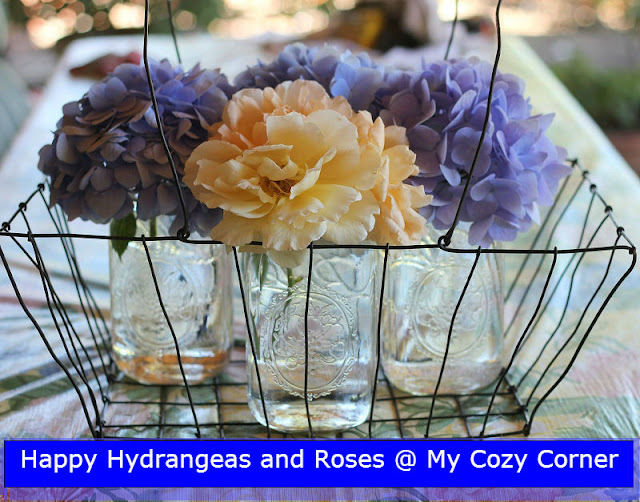 I love your pretty hydrangeas, they look lovely in the glass jars and wire basket. Beautiful photos, have a happy week ahead! I love the way you have placed the blooms in the jars in the basket. They really look lovely. I had two hydrangea bushes here when we bought our house. Every year I chop them back and they come back again beautifully, so I hope you do well with yours. Mine are starting to drop their leaves, time for winter pruning again. Have a wonderful week. I am joining you through Mosaic Monday. Beautiful blooms! 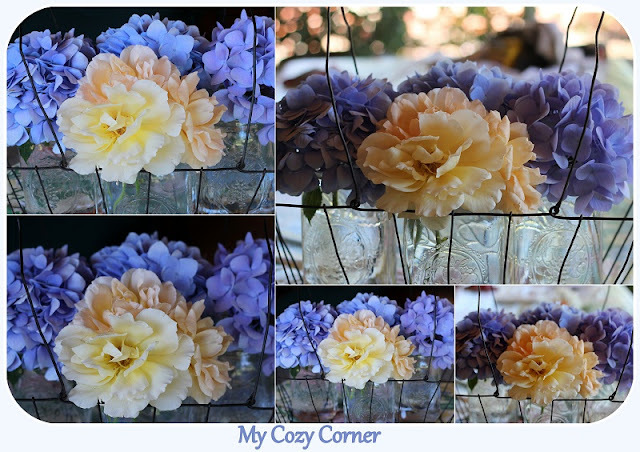 Love those blue hydrangeas! Ooo, I've always wanted to have a Jenn-Aire, but I've never had one. I do love blue hydrangeas! Thanks for joining in to Blue Monday, Betty. Your blog is certainly an inspiration to me almost every week I take a peek. I love fresh cut flowers during the summer. Your roses and hydrangeas are gorgeous! These are really lovely! It's fun to play with your photos! Love the flowers specially in those canning jars and wire basket. Gorgeous blooms in the perfect setting, your photos are so pretty! Thanks so much for sharing at AMAZE ME MONDAY! Your hydrangeas are gorgeous and what a pretty picture they make in those jars! Love the wire basket too. So happy you have shared this at my HOME and have a lovely week celebrating the 4th!